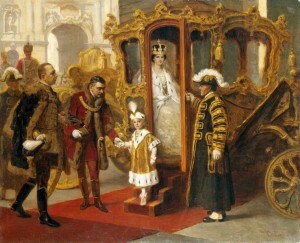 4-year old Crown Prince Otto of Hungary in Budapest in 1916, attending his parents' coronation as King and Queen of Hungary, painted by Gyula Éder. The news has an element of sadness, but also of hope. The element of sadness is that Otto von Hapsburg, a good and courageous man whom I had the privilege to meet more than once, died Monday at the age of 98. Otto’s father, the Blessed Karl (also sometimes called Charles), the last emperor of Austro-Hungary (he died 1922, just after the first World War), was a saint. Otto was his oldest son, and so, had history not changed, he would have been an emperor. 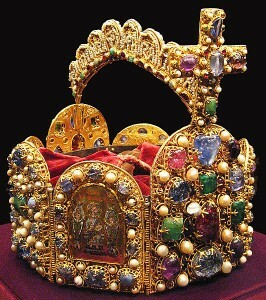 But with Karl’s passing almost a century ago, the Holy Roman Empire, a form of political organization marked by openly, sometimes militant, Catholic faith and dating back (with a few twists and turns) to Charlemagne’s coronation in the year 800, came to an end… after 1,100 years. Now, with Otto’s passing, the memory of an openly Catholic political culture in once-Christian Europe seems to fade even more permanently into the pre-modern mists. And yet, there is also an element of hope because something unexpected is stirring in the heart of Europe, in that part of the Holy Roman Empire known as Hungary. And part of the reason for this is the remarkable, quiet leadership of a brilliant Churchman, a tall, powerfully-built, 59-year-old Hungarian archbishop whom John Paul II admired and made the youngest cardinal in the college of cardinals in the consistory of 2003, eight years ago. 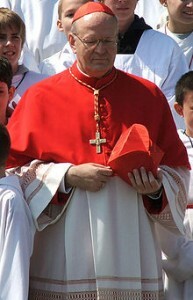 Cardinal Peter Erdo, Archbishop of Esztergom-Budapest and thus Primate of Hungary, unlike almost every other major Church figure in Europe today, has managed during the past decade, very skillfully, to help his country win back some territory from the massive forces of secularization and individualism which seem to have turned Europe into a vast open-air museum without a vibrant, beating heart, without many children, and without a desire to sacrifice today to build a future. Erdo is also the President of the Council of Episcopal Conferences of Europe — making him, in a sense, the head of Europe’s bishops — and is today the second youngest member of the College of Cardinals. And for this reason, I will be heading to Budapest, to spend time with Erdo, and to discuss with him his vision for his country, for Europe, and for the Church. Here is a brief summary of Otto von Hapburg’s life and passing. The oldest son of Austria-Hungary’s last emperor, Otto von Habsburg, died on July 4 at his home in southern Germany. He was 98. 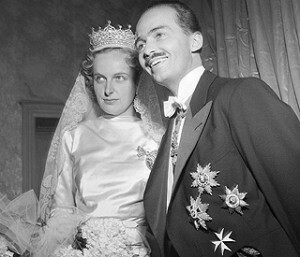 Born in 1912, Habsburg witnessed his family’s decline after the Habsburgs were forced into exile in the United States following World War I.
Otto with wife, Regina von Habsburg (d. Feb. 3, 2010), at 1951 wedding. Habsburg re-settled in Europe in the 1950s and was appointed member of the European parliament for Bavaria’s conservative Christian Social Union. He was elected to the European Parliament at the first direct elections in 1979 and for the following 20 years worked tirelessly to help strengthen the European Institutions. His main interests were in European integration and foreign policy. Otto von Habsburg embodied the history of European integration like no one else. The son of the last Austro-Hungarian emperor fought all his life for democracy, freedom, and understanding among the peoples of Europe. From the beginnings of the movement for European integration following the end of World War II until the now-famous Paneuropean picnic on the border between Austria and Hungary in 1989, he succeeded in overcoming borders and showing Europeans a way forward to a common future. 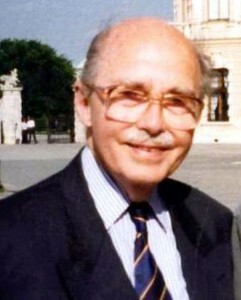 Otto von Habsburg was an example of a successful European. He was the son of Blessed Charles (or Karl). It seems for a lay person to be canonized or beatified it is necessary to be royalty or a martyr. This article does not stress Otto’s firm commitment to peace and reconciliation in Europe and his wonderful contributions over a long and heroic life.